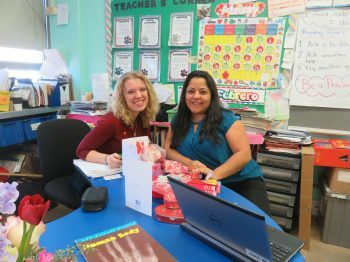 It is week 5 of my student teaching experience – which is something to celebrate! We are 1/3 of the way through the semester! Although it is only a short while away, there is still a lot of lesson planning, edTPA, and job fairs that stand between me and graduation. It was a nice reminder to enjoy this experience and the kids I get to work with every day. While it may be easy to focus on what didn’t get done that day, ultimately I am there for the students and to help them learn and grow. 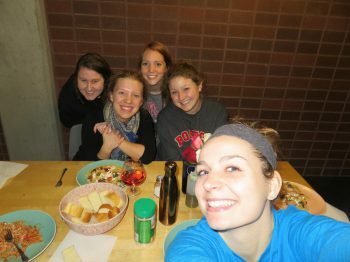 On Wednesday, I decided to cook for my roommates (with their help of course.) It took a little longer than anticipated, but the end result was a success – pasta, laughter, and storytelling. On Thursday, my teacher texted me before school to say that she wo uld not be coming in because she was sick. I wasn’t too concerned since I had already experienced full control when we had had a sub earlier and I had a plan this time. Since it was “A Day Without Immigrants” many of the students in my classroom and throughout Cooper were not at school, which made class sizes much more manageable and kept behavior problems to a minimum. The day didn’t go quite according to my plans since I had to postpone filming and teaching lesson 4 of 5 for edTPA until Friday when all the students would be there. Other than that, I felt much more comfortable “subbing” this time since I knew the students and the curriculum plans. Overall, my biggest celebration is that every day I am getting closer to graduation and becoming a better teacher through this experience! This coming week I take over another science class and have my second observation – this will be my final week of partial control before six weeks of full control!